180 Degree Turn Time20 sec. Chikuma — Japanese Tier II cruiser. Incredible armor for its tier. Fastest current Tier 2 cruiser at 26.4kts. Gun range is good before the upgrade. Maneuverability is poor, comparable to same tier battleships. Has less concealment than the Chester. Is prone to getting its engine disabled in battle. Hull: Upgrade to Hull (B) for an improved rudder shift time, additional hit points, and four additional main battery turrets. Research of this module unlocks progression to Tenryu. Gun Fire Control System: Upgrade to Type 2 Mod. 2 for an extra 10% range on the main battery. Research of this module unlocks progression to Umikaze. Slot 1: Main Armaments Modification 1 ( ) keeps your guns firing. Chikuma captains should mount the standard flags to improve the ship's performance in battle. India X-Ray ( ) and Victor Lima ( ) flags are recommended to improve the main battery's fire chance. To improve the ship’s survivability, captains should mount November Foxtrot ( ) and India Yankee ( ) flags. Sierra Mike ( ) flags are recommended to increase the ship’s top speed. Lastly, economic and special signal flags can be mounted to improve the ship’s economic gains per battle. The three Chikuma-class cruisers (筑摩型防護巡洋艦 Chikuma-gata bōgojun'yōkan) were protected cruisers operated by the Imperial Japanese Navy. They participated in numerous actions during World War I. The class is named after the Chikuma River, in the Nagano prefecture of Japan. 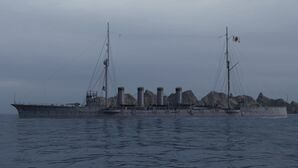 The Chikuma class was the final class of protected cruisers in the Imperial Japanese Navy, and was followed by the Tenryū class of light cruisers. The basic design of the Chikuma-class cruisers was modeled after the Royal Navy Town-class with some modifications and was also largely influenced by the design of the Tone The silhouette of the Chikuma-class was readily distinguishable due to its four tall smokestacks. Chikuma was propelled by two Curtis steam turbine engines (produced by Kawasaki, with a total capacity of 22,500 shp, which drove two screws. The engine had 16 Kampon boilers. These newly developed engines gave the ship an incredible (for the time) 26.87 knot speed in trials, but problems with material strength in the gears of the new engines created a maintenance nightmare, and Chikuma could seldom live up to its potential. The ship was armed with eight QF 6 inch /40 naval guns, one each fore and aft, and three mounted in sponsons on each side of the hull. Ships of the Chikuma-class were unusual in having the same weapons for its side armament as for its main battery. These guns were supplemented by four QF 12 pounder 12 cwt naval guns and two 7.7 mm Lewis Guns. In addition, she carried three torpedo launchers with 457-mm torpedoes. After 1919, two 8 cm/40 3rd Year Type naval gun were added for anti-aircraft defense abeam of the fourth funnel, replacing three of the 12-pdrs. Chikuma participated in World War I, as part of Japan's contribution to the Allied war effort under the Anglo-Japanese Alliance. She was in the Japanese squadron which gave chase to the German East Asia Squadron led by Admiral-Graf Maximilian von Spee in 1914. The Imperial Japanese Navy also dispatched the cruisers Ibuki, Chikuma and Nisshin to the Indian Ocean to deal with the threat posed to shipping by the German cruiser Emden. From December 1914 to January 1915, Chikuma and Yahagi were assigned to patrols off the coast of northern Queensland, Australia and on 26 March 1917, the British Admiralty further requested the deployment of Chikuma and Hirado to Australia and New Zealand to protect shipping against German commerce raiding operations. After World War I, Chikuma was assigned to patrols of the China coast from 1921-1924. After 1924, she was deemed too obsolete to be of any further combat use, and was primarily used as a moored training ship at Yokosuka Naval District after having been officially transferred to the reserves. Chikuma was officially stricken from the navy list on 1 April 1931. Her hulk was designed Hai Kan No.3 and expended as a target in 1935. This page was last modified on 4 December 2018, at 21:02.